What the SH-02K has is security and durability – it is the only type of phone that certain maximum security factories and offices will let pass through their gates. Both the phone storage and the microSD card (up to 256 GB) have their contents encrypted to prevent information leakage in case of loss or theft. Using the function restriction tool, it is possible to disable Wi-Fi, Bluetooth, tethering, browser, etc. and enforce a screen lock or restrict calls to certain destinations (e.g. only exisitng phone book contacts). The SH-02K has a convenient voice memo shortcut – press and hold the side key and recording starts, with the voice recording specially developed for convenient use at meetings/negotiations. The phone has full support for international radio frequencies, so it will work on LTE, 3G, and GSM networks worldwide. VoLTE compatibility is implemented for high-quality audio during calls. To further aid clarity of hearing, the SH-02K comes with a high sound pressure level received, which enables you to hear the other party even in noisy environments. In addition to standard emial protocols such as POP3, IMAP4, SMTP, the SH-02K also supports MS Exchange profiles (enterprise email for the business) so that you don't miss out on those high-priority company emails. The quick-open push button on the hinge now also activates manner mode, in the unlikely event you forget to enable it in a meeting or on the train. The SH-02K is waterproof (IPX5/8), dustproof (IP5X), and shockproof (MIL-STD-810G). Like you typical flip keitai, it comes with a 3.4-inch main QHD display and an external 0.9-inch EL organic sub-display for quick diusplay of notifications. Supported connectivity methods include Wi-Fi b/g/n (2.4 GHz only), Bluetooth 4.1, and Infrared. The SH-02K is equipped with mobile wallet functionality (Felica only), Area Mail for earthquake warnings, and GPS. It is powered by a quad-core Qualcomm MSM8909 processor clocked at 1.1 GHz, has 1 GB of RAM, and 8 GB of ROM – the SH-03H has an MSM8210 dual-core CPU, 1 GB of RAM and 4 GB of built-in storage. The phone's operating system is a heavily customised Android that has been stripped of all its entertainment – but very importantly, all its Google tracking functionalities. 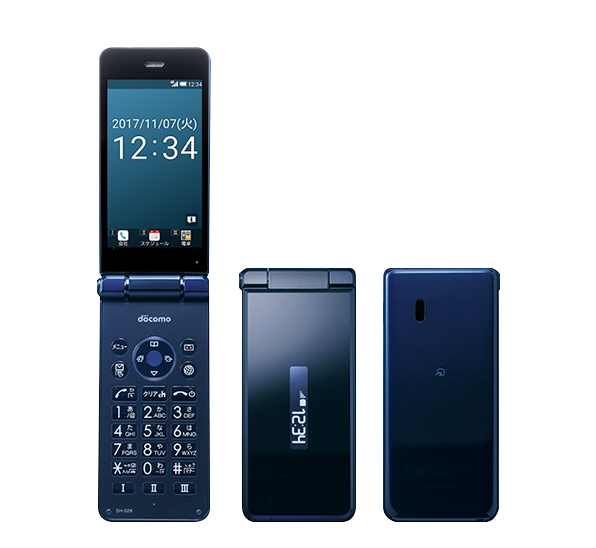 Sharp/Docomo do not specify which version has been used as its base. The SH-02K weighs 131 grams, measures 113 x 51 x 16.7 mm, and is only available in blue-black.